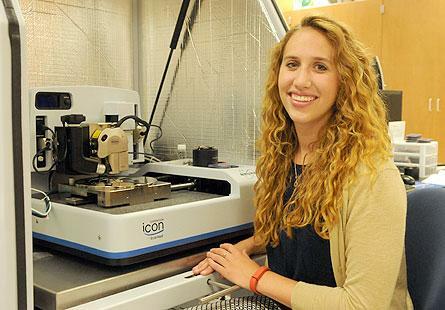 Hope junior Monica Ohnsorg of Chanhassen, Minnesota, has been named one of 16 national finalists in “NDConnect 2014,” a competition sponsored by the University of Notre Dame to recognize outstanding undergraduates in nanoscience and nanoengineering. A chemistry major at Hope, Ohnsorg is the only finalist from a primarily undergraduate institution. The finalists were selected from applicants who submitted research proposals in the spring, then followed up with a report in August documenting their research findings. They are being provided travel support to visit Notre Dame on Friday, Oct. 17, to compete for first-, second- and third-place prizes of $3,000, $2,000 and $1,000 respectively. Ohnsorg was selected on the basis of her project “Fundamental layer-by-layer formation of surface anchored metal-organic frameworks.” She has been conducting the research collaboratively with Dr. Beth Anderson, who is an assistant professor of chemistry and Towsley Research Scholar at Hope. Ohnsorg began working in the Anderson lab during the 2013 spring semester of her freshman year. She continued the work through Hope’s Research Experiences for Undergraduates program during the 2013 and 2014 summers, and volunteers in the lab part-time during the academic year. The research involves understanding the formation of extremely porous materials called metal-organic frameworks (MOFs), which are used for gas storage, separations, and reaction catalysis. Ohnsorg’s work uses atomic force microscopy to characterize extremely thin films of these MOFs, studying their deposition one molecular layer at a time. She has quantified overarching trends to understand the interface between film and surface which will help these films to be better used in applications ranging from air purification to drug delivery. In addition to research, Ohnsorg is an Arnold and Mabel Beckman Scholar at Hope and a recipient of the college’s Jaecker Chemistry Scholarship at Hope. She aspires to continue education in graduate school to pursue a career in nanobiotechnology, researching nanomaterials for drug delivery and tissue engineering. Her other activities have included the Chem Club, Society of Women Engineers, Water Ski Club, Chapel Choir, Collegium Musicum, Women’s Choir, College Chorus, and Nykerk Cup competition. She is a 2012 graduate of Chanhassen High School, and is the daughter of Greg and Dana Ohnsorg of Chanhassen. The other 15 finalists come from universities located across the country, from Massachusetts Institute of Technology in the east, to Stanford University in the west, to the University of Texas in the south. The winners on October 17 will be selected by industry judges from Thorlabs, IBM, Texas Instruments, Seagate, Raytheon, RFMD, General Electric Global Research and BP. The Hope College Great Performance Series will feature Sweet Honey in the Rock on Friday, Oct. 17, at 7:30 p.m. in Dimnent Memorial Chapel. Hope College will present a student scholarship recital on Saturday, Oct. 11, at 7:30 p.m. in Dimnent Memorial Chapel.